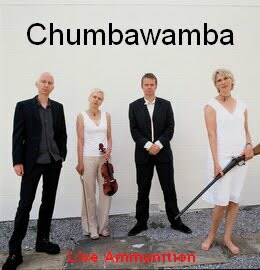 Make all the cheap one-hit wonder jokes you must but English-anarcho-folk-dance-punks, Chumbawamba have broken up (band statement here). This ends an endlessly fascinating (and not always enjoyable) thirty year career. It's terrible news, as their last three albums have been the most consistent of their career (with the possible exception on my beloved English Rebel Songs). As my send-off, here's a live bootleg of the smaller, folkeir version of the band playing in 2010 in Kassel, Germany. P.S. 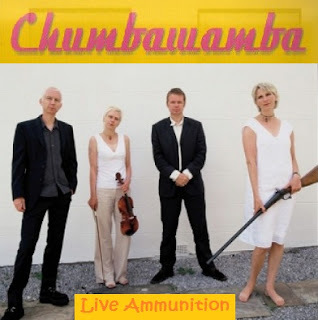 if you wanna hear some more rare Chumba, please leave a COMMENT, I have a folder full of oddities and absurdities to share, if you're willing. So what do you make of the loss of Chumbawamba? So outside the box and so underrated. It's a shame that they'll be remembered for "that song" when they had so much more interesting material. Another distinct voice ending. We'll probably never see the likes of them again in this top 40 homogenized music world full of retreads who think they sound so hip. Thanks for the show - it looks good. They do deserve to be remembered for so much more than 'that song but I think history will vindicate them - their catalog is too deep to be ignored forever. I promise you that that single will be a part of this series! still remember hearing Jesus H Christ for the first time and i was hooked from there on out. Maybe that will make it up here too. Good riddance to these ridiculous posers, whose claim to be an anarchist collective was as false as their music and lyrics were dreadful. They promoted violence and attacked anyone who participated in charity events, like live aid. Bad music, bad politics, good riddance. I'm afraid you've over-simplified (and sometimes misunderstood) the band). There's lots they did to criticize but I hardly feel you've discussed those things! I love how much they piss people off like Anon above, or the smartass rock critics in the Well Done: Now Sod Off documentary that's excerpted on the DVD released with the Readymades CD. Does anyone know if the full-length documentary is accessible anywhere? Frustrating, hapless, hilarious, intermittently brilliant, self-contradictory, they were a wild, fun, righteous mess of a band and it'll be a drag not having them around. Thanks for sharing the show, Jeffen, and breaking the bad news. "I love how much they piss people off like Anon above"
Yeah there skill at drawing out venom was amazing! PS Groovy -the whole film's on YouTube. Great stuff - more please - I agree that they strated well, faded and were then reborn - The Boy Bands Have Won! Yeah it's a weird 'evolution. I'll miss them, contradictions are part of politics and I know what side of the line I stand. Now they'll individually live off free social benefits while protesting the state that gives them free social benefits. "Do they owe us a living...?" Great band that. I hope they've turned some heads. link is dead, could you upload it again ? Jakob Dylan and Mick Jones Reboot the Mission! The Strongest Politlcal Ad of the 2012 Campaign?